Amber waves of grain blanket the land as far as the eye can see on a farm near Circle, Montana. Whether you're looking to get away from the hustle and bustle of the city life or just learn something about American farming tradition, you'll find it all at Wolff Farms Vacation Home. We cook three great meals a day or we'll pack you a picnic lunch for your day of site seeing. There are chances to take a horseback ride and learn from one of the nation's best collegiate rodeo competitors. Whether you're wanting to learn to rope, help doctor some cattle, listen to the music of the Montana meadowlark or the quacks and honks of the ducks and geese, seclusion has never been so relaxing. There's plenty of wildlife to view or take that perfect photograph. 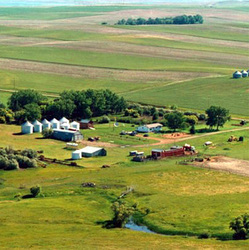 Directions: Wolff Farms is located 10 1/2 north of Circle, then 4 miles west of Montana Highway 13.